Give anyone who asks this, the answer that Whistler gave to someone when asked how long it took to do his “Nocturne in Blue and Gold”. He said, “It has taken me a lifetime to get to where I can even begin to do this”. It always amazes me when someone asks me, “How long does it take to paint a painting?” I had wanted to create this painting shown above for the last two years. I then realized that painting a painting not only means the actual applying of paint but additionally the process of which it takes you to get to the point of application; some say years, some say a lifetime. I guess the other question could be “When is the painting done?” There is a point when one extra stroke could ruin it and one less stroke would leave it unresolved. I guess I would rather have one less stroke. On observing a woman painting one day, I noticed that she continued painting until she had painted five separate paintings on one canvas, because she refused to stop and get another one. Each painting was beautiful in its own right, but soon became something else. After seeing that display I would often think it would be great to have an observer to tell you when to stop. My process most of the time is to take photos for inspiration, then I may play with the photo that interests me, either change the color, always the composition, eliminate, exaggerate, combine with other photos, etc. Then the process is in my head. I see the painting painted in my minds eye. In fact, I have been known to paint a painting many times in my head before painting. Sometimes I do small studies of the painting. So much of the painting is done prior to painting the painting the process could go on for months or weeks. I may come back to the idea over and over until it pushes me to paint it. My mind is full, my passion is deep and my energy is at its peak, waiting to erupt at once at the canvas. I need this tension prior to my painting. Through this process it allows me to spew out the painting in a dramatic speed. I become an action painter, desiring to get out as much as possible on the canvas and as quickly as I can, fearing that my vision may disappear. Everyone has his or her own style, which is another factor of time involved. Some are contemplative painters, some are action painters or perhaps a combination of the two. Some take years to paint a painting. Some have paintings that are ongoing and never completed, others may do a painting in a couple of hours. They are all approached differently, but in the end we all take our experience to each painting; we bring our education, our many hours of painting and knowledge of a subject, which is impossible to measure. All this combined can be added to the time it takes to paint a painting. So the answer to “How long does it takes to paint a painting?” could be 2 hours, a day, a week, plus 25 years; 25 years of experience. 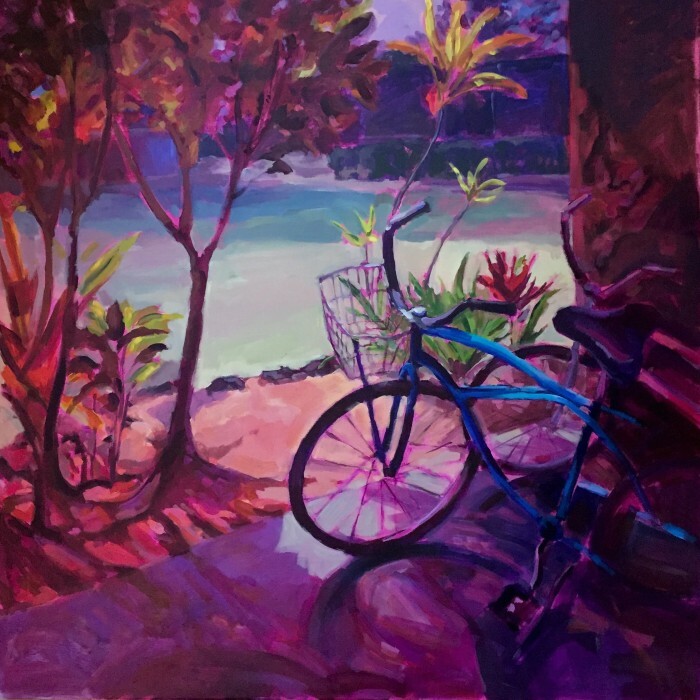 ** “Bicycle Memories” 36″ x 36″, acrylic on gallery wrapped canvas, Price $3240, If you would like to purchase this painting please contact me at jvander51@msn.com or call (408)460-7237 Thank you! Whistler has it right there! I’ve experienced this attitude, and had this question asked of me so many times, and by all sorts of people. After which, you can see them doing the sum in their head to work out *just* how much they think that it’s worth…and I never really knew what to say, without sounding a bit narked. These days, I say very much something on the same lines as Whislter, but in future I might quote him. It’s such a shame for everyone that hardly anyone appreciates what art is really worth. But it seems endemic in UK, and government-led (cut arts funding). What message does that send out to everyone? How’re artists supposed to survive? I appreciate your comments on the true value of art and the time expenditure that leads to the joy I find in my art. I may not be the finest of artist but I do call myself one due to individuals like yourself who have helped me realize things you love require an investment to flourish. It’s amazing what you can discover forcing yourself to do a 20 minute painting. Thanks for your comment Patrick! I have had unfinished paintings that lay dormant for years and others that splashed out joyously in days. 99% of my paintings (can you start a sentence with a percentage?) are already completed in my head, it’s that space between my hand and imagination that gets a little jammed up like a winter river struggling through ice floes. I remember in college I had a 10:00 am watercolor class. There was another student that said she would sometimes get up about 7:30 am and do the painting assignment real fast before class. I remember feeling both terrified and fascinated as I took my work very seriously then and did not dare procrastinate!! Her paintings were pretty good.